Approximately 80 state and federal firefighters are working to contain a lightning-caused wildfire that ignited Sunday about 15 miles southwest of Fairbanks. A mapping mission late Sunday night estimated the size of the Livingston Fire at 167 acres, about half the size of the original estimate of 320 acres. This map shows the perimeter of the Livingston Fire (in red) burning in the Rosie Creek area about 15 miles southwest of Fairbanks. The fire is located in the Rosie Creek Area east of the Parks Highway between the highway and the Tanana River. 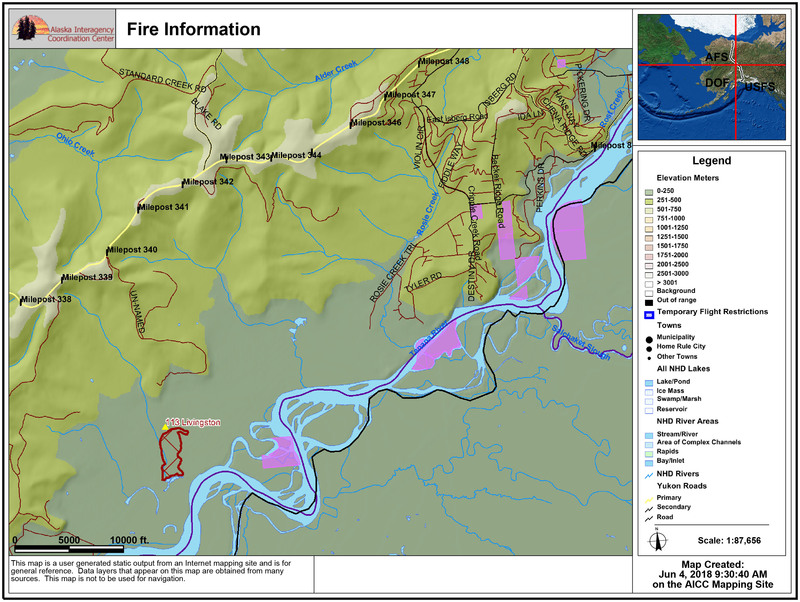 The head of the fire is approximately 5 miles east of the highway and a half-mile from the Tanana River in the vicinity of Sam Charley and Hadley islands. Personnel were not able to reach the fire by road because of wet conditions and firefighters had to be transported by helicopter to reach the fire. Three 20-person crews from the Alaska Division of Forestry and BLM Alaska Fire Service are working today to secure the edges of the fire by cutting and digging a line around the 2.8-mile perimeter. Water-scooping aircraft are also being used for strategic water drops to support the work done by firefighters on the ground. A load of eight smokejumpers from the BLM Alaska Fire Service were air dropped Sunday evening to protect five cabins located approximately 1 mile southeast of the head of the fire. Smokejumpers are clearing around the cabins and setting up sprinklers to wet them down in the event the fire does spread toward them. A Division of Forestry air tanker based at Fort Wainwright dropped multiple loads of retardant around the fire Sunday night to prevent it from spreading. Four water-scooping aircraft from the BLM Alaska Service, also based at Fort Wainwright, were called in to drop water on the fire and a helicopter from the Fairbanks Area forestry office was also used to perform water drops. The fire grew quickly Sunday night as it moved southeast toward the Tanana River but slowed considerably when it ran into wet, marshy terrain. The wet ground, along with the work done by aircraft, dramatically reduced fire behavior and growth. The fire was reported just after 5 p.m. Sunday after several members of the public reported seeing lightning strikes in the area.